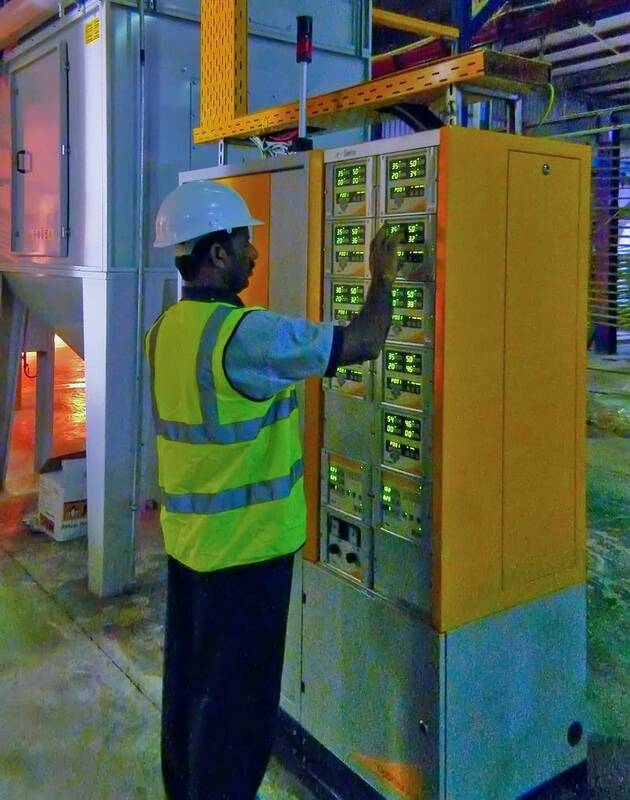 (ARAPCO), was established in 1991 with highly qualified and experienced Engineers to meet ever increasing requirement from cunstruction industry for Aluminium powder/Kynar coating and processed glass products. 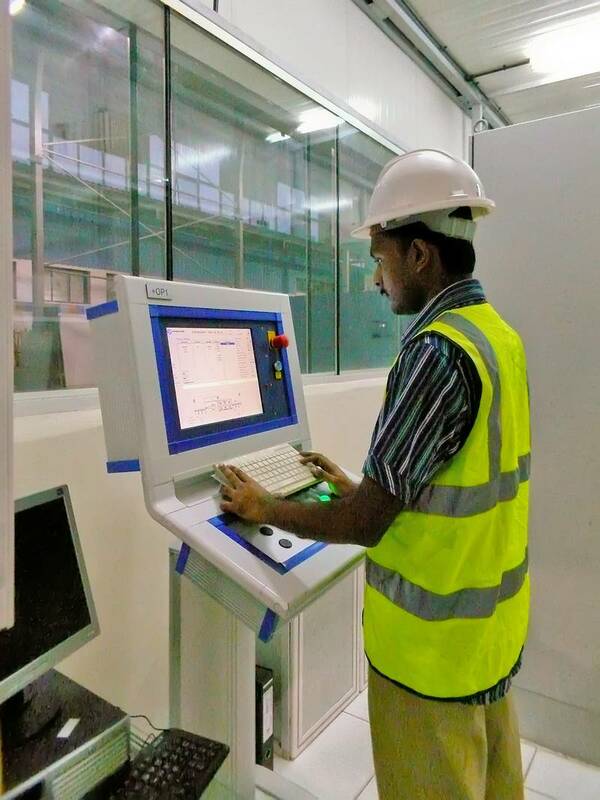 ‘ARAPCO’ dedicated international quality facilities in Architectural Glass processing and Powder Coating segment by providing most advanced machineries enhanced with modern European technology. 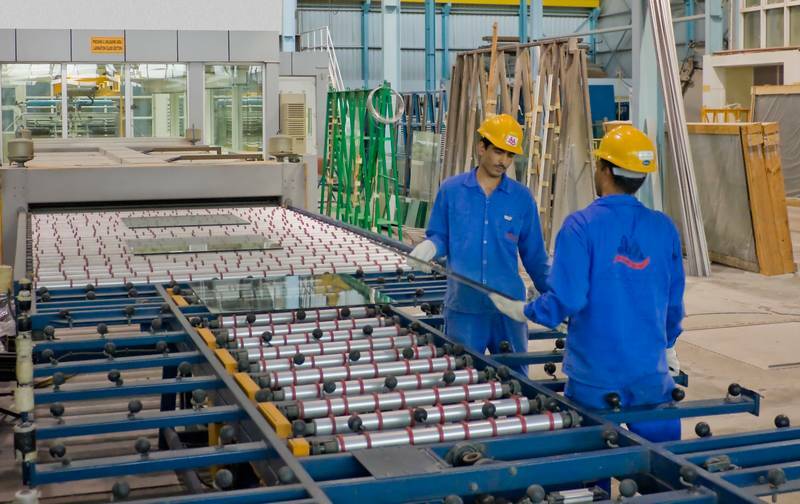 Since the establishment of the Arabian Aluminum Products Co., our principal objective is to challenge the technology development and the employment of the most modern equipments for the glass thermal treatment. 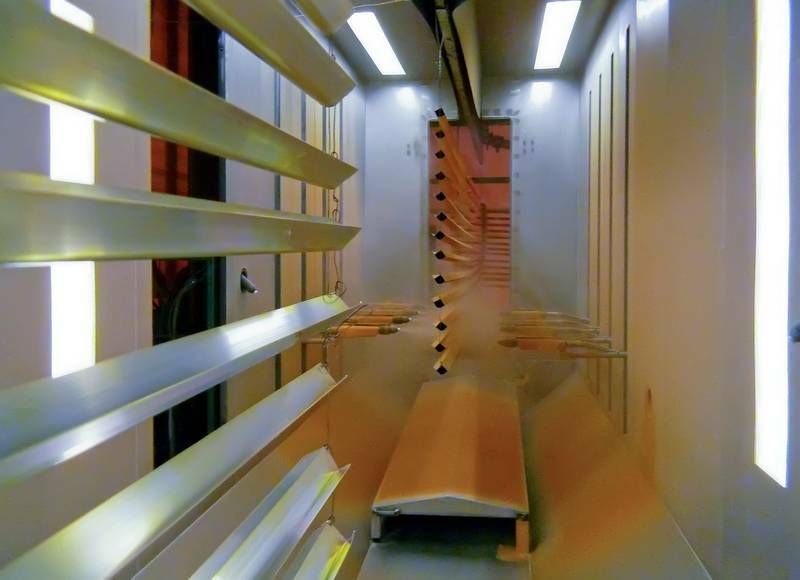 Based on this Principe, we became one of the first companies using the thermal treatment oven (htf 2442 manufactured by TAMGLASS FINLAND company) This type of oven is characterized by its capacity of thermal stiffening for all kind of transparent or colored glass as well as of other special kind glasses. It is also distinguished by its high productivity compared with the other ovens of the same model, also by the high quality of the product. 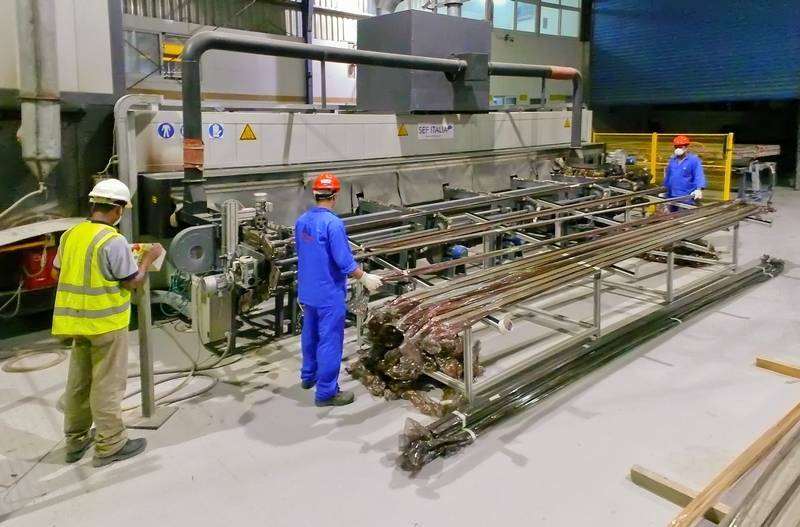 Edges treatment unit (edge delicion) especially to prepare a special kinds of glass (coated glass) where it polishes its edges to facilitate its grouping with the aluminum frame. Automatic washing unit: it is distinct by its capability of washing the glasses with sensitive color coat and high reflexivity. 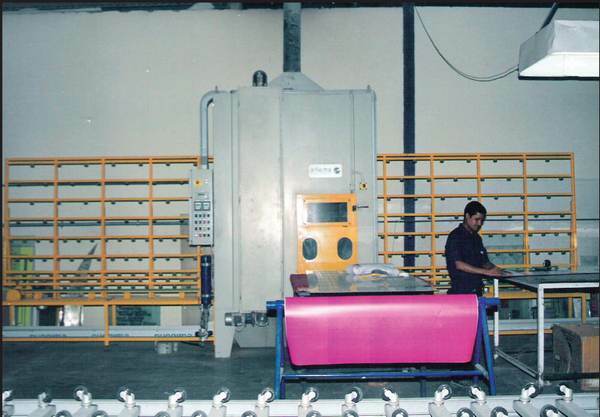 Automatic grouping unit: it is distinct by the speed in preparing the special frame for grouping the double glass. Pressing Unit: it is distinct by the speed of the glass pressing operation as well as by giving a high quality ofthe product. 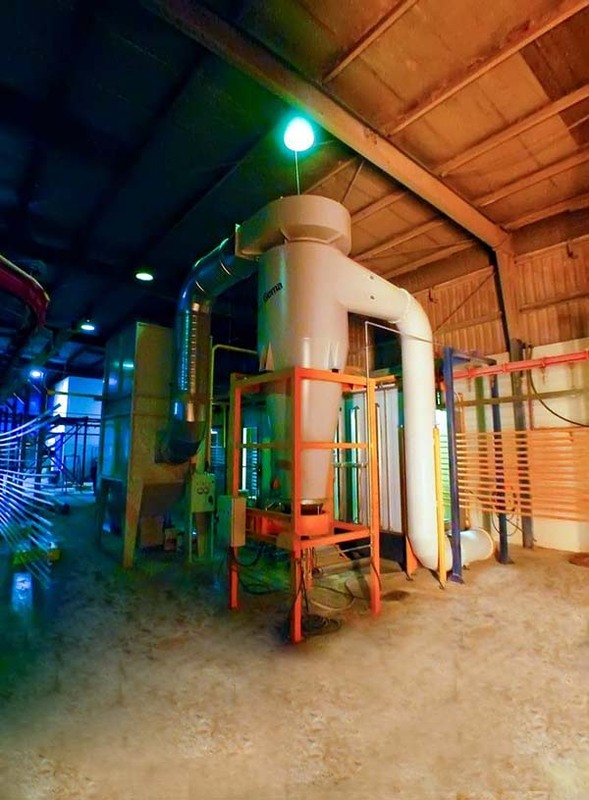 Insulation Unit: which works automatically and proceeds the insulation operation by using a robotic arm. It is distinct by its capability to insulate a piece of glass of 90 * 90 in a speed of 28 seconds. By using this line, we can manufacture a piece of glass of a dimension of 5000 * 5000 mm. 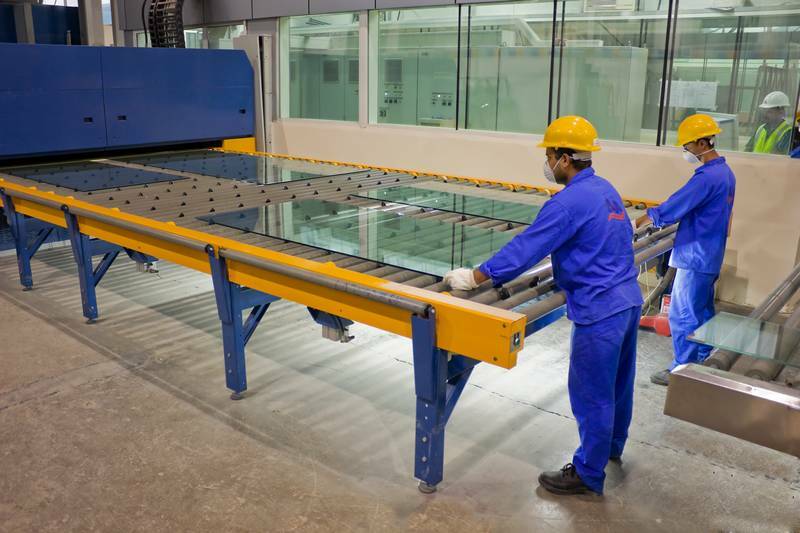 In adding together all these specifications, the production capacity of this line could exceed 800 glass pieces within 8 work hours, all in preserving the high quality of the double glass. One of the characteristics of this line is to reduce the employment of workers from 20 to 8 workers, and to reduce the use of silicon to 30% compared to the first line. 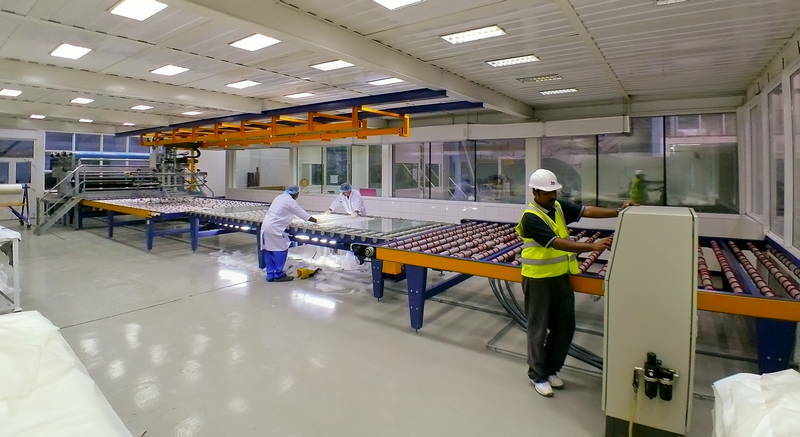 With the development of the different kinds of glass and the requirements of the security and safety in dealing with the glass facade and domes, the Arabian Aluminum Products Company seeks to present this product that is considered one of the safest and most secure kinds of glass. 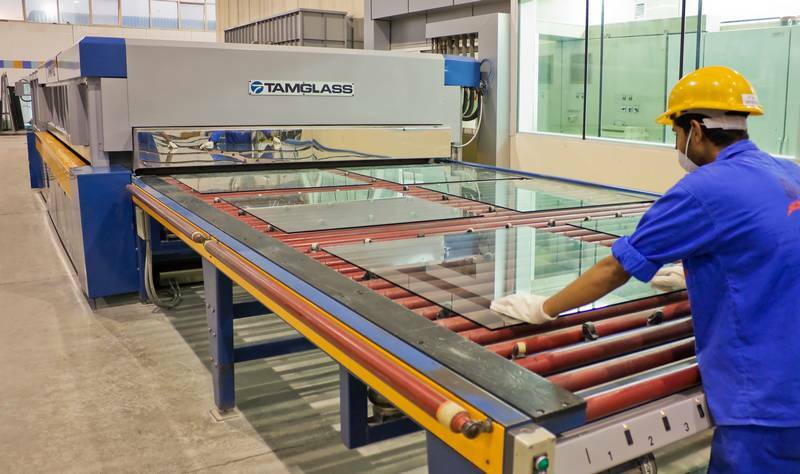 • Laminated glass is formed of two or more coats of plastic gelatin specially fabricated for this purpose. 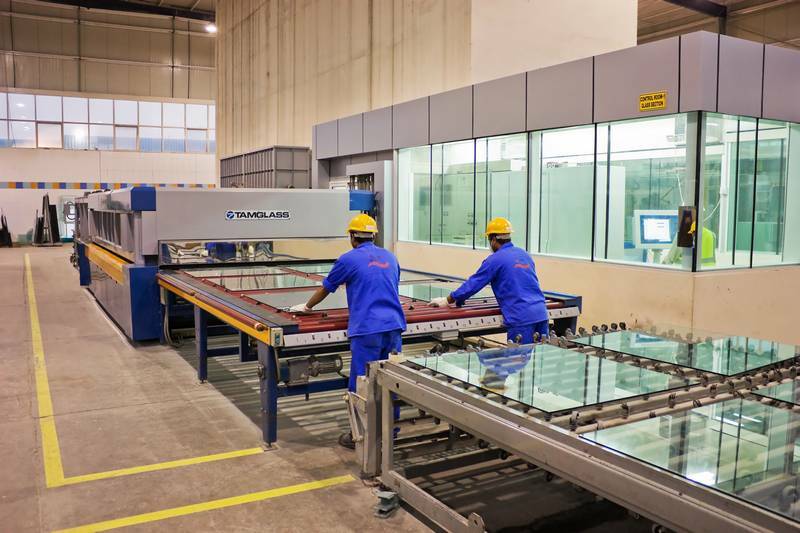 • The glass is grouped automatically, by using the most modern machines available in international market, under the supervision of competent engineering and technicians trained for this purpose. 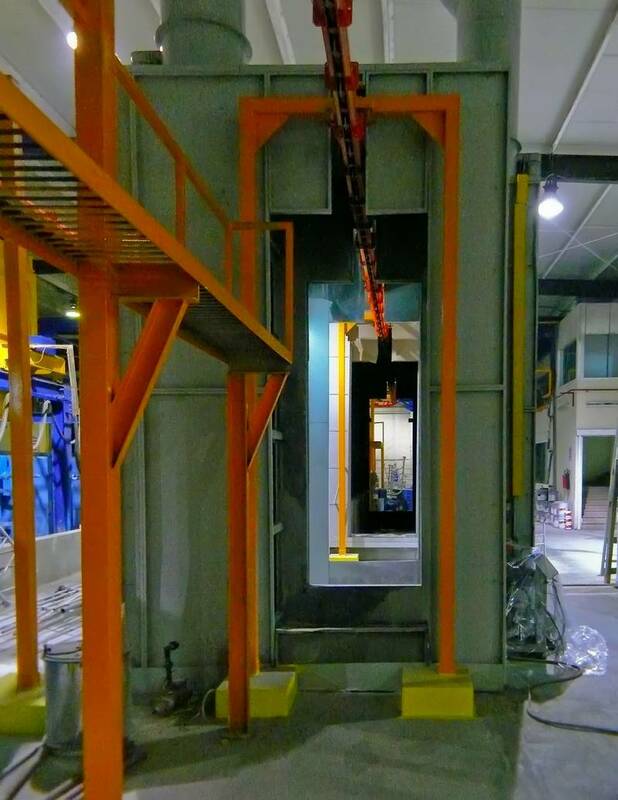 • The productivity of this line can reach 800 square meters every 8 hours (3 mm + 0.38 + 3 mm). • The capability of grouping the large sizes that reach (240 cm x 300 cm). • Making special anti ballets glasses, this is formed of several lays that suits the safety and security requirements. 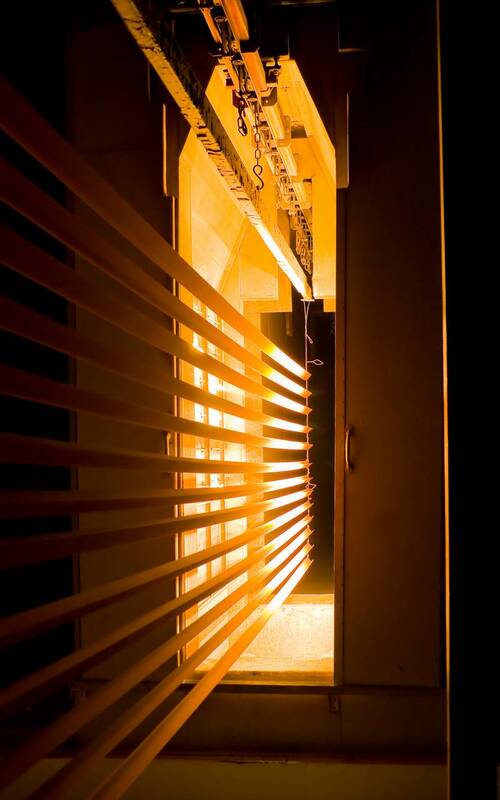 • The thickness of the fabricated glass reaches up to 6 cm. 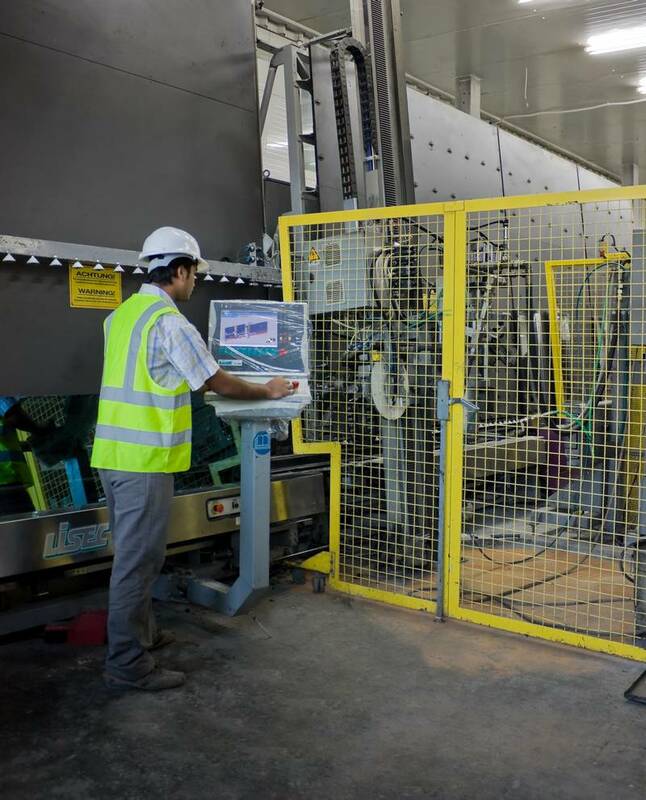 The OPTIMAX series plants are designed for the automatic cutting of coated and non-coated float glass. High speed with high precision. The glass flow can be from left to right or right to left, as required. The integrated conveyor belts permit incorporation into complex production lines. Available both with electronic system and PC . • Polishing glass edges in any thickness. • Giving high quality and esthetic shape for the glass edges by using various shapes of modern stones in rectilinear shapes. • Can make any kind of external rectilinear edges as well as the polishing by using the most modern chemical treatment for the glass edges purity and transparency. • Automatic feature to change the thickness of function within few seconds. • The (CNC) Unit contains a control panel that provides to the operator the opportunity to modify and entering the thickness of the different glasses, as needed. • The computer unit of the design contains a (SCANNAR) unit by which it can be possible to make and desired draw or design. • Can write on glasses and mirrors by using a special pen designed for this purpose. • There is also a mountable head that cuts the glass in any form. • Contains several stones with different thickness, starting from 25 m - 3 mm. • Operating area is up to 1400 mm - 2800 mm of glass and mirrors. • Can make 30 linear meters in 1 hour. • Can make any design on the glasses and mirrors through the evacuation to draw on the used spaces. 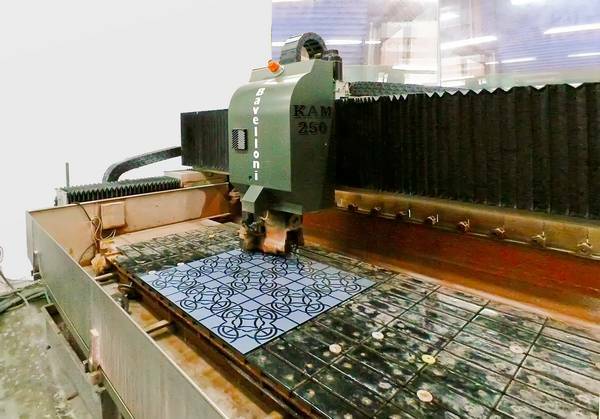 The machine starts after that by filling the gaps by automatic air and sand pressure, using (CNC). • It blasts the vision proof glass used in the kitchens, bathrooms and other multi uses places. It is possible to draw certain designs on it. 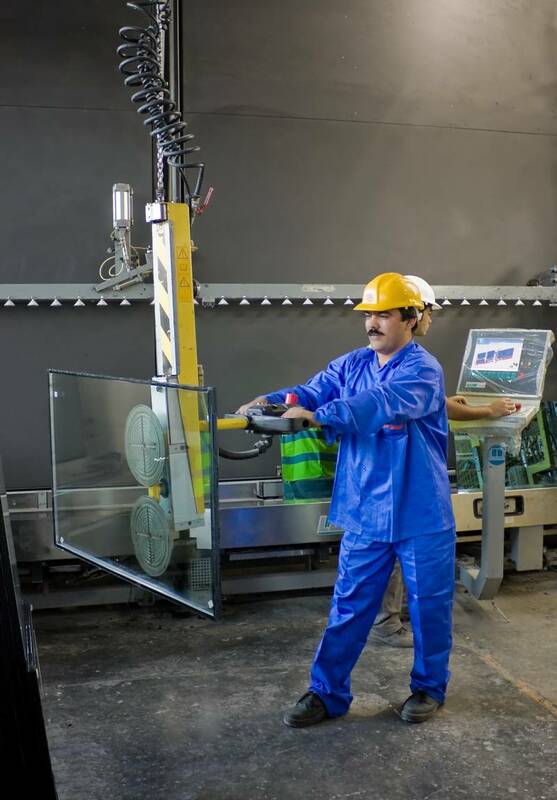 • High speed productivity by the use of high technical methods inside the machine, because it is provided with a robotic arm, which blasts the glass upon the desired height, which the operator provides through an electronic screen. Also there is a line to coat the wooden colors on the architectural aluminium, using thermal transformation. 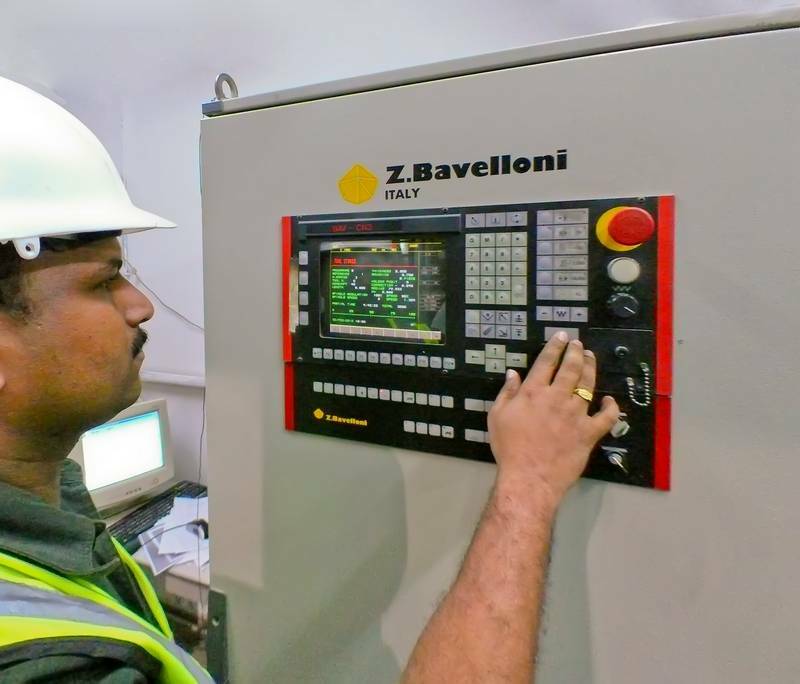 It is the first faclory establishing in U.A.E by this method, product of SEF ITALIA, under the number TC-403-B. lts longitude is 7 meters wilh a approximately productivity capacity of 180 aluminium bars in one hour. 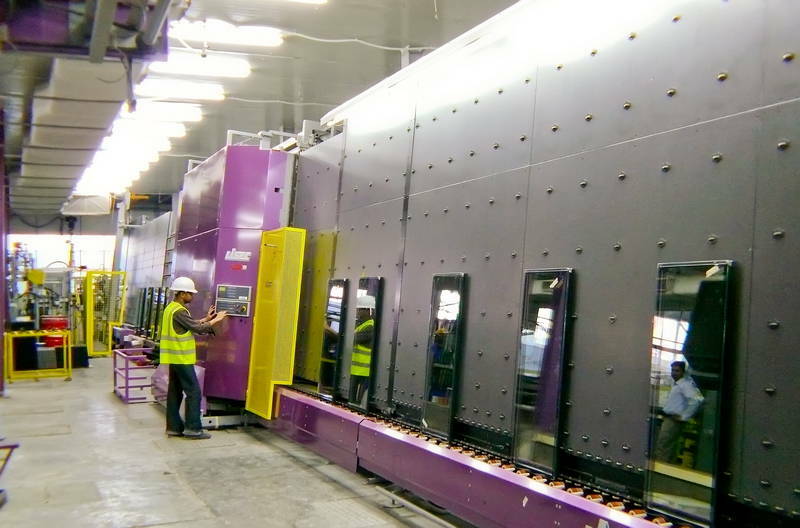 There are two lines of the biggest architectural aluminium coating lines production on the level of the UAE. 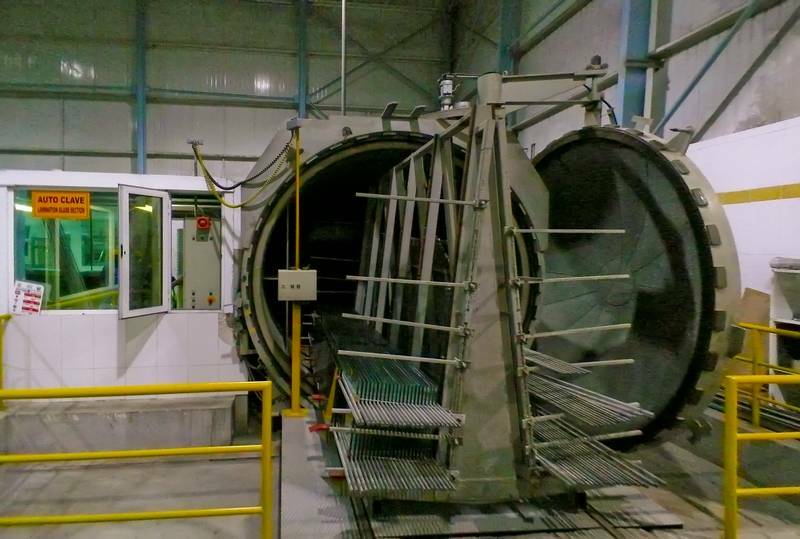 It is the only estabilishment that possesses one of the biggest oven and aluminium coating treatment by electro static system. • Aluminium coating system by using powder or liquid coating.